DOWNLOAD YOUR FREE WEDDING VIDEO SHOT LIST! Fill Out the Form Below to Get Your Shot List! If you are a wedding videographer, what part of your business do you need help with? What is the Wedding Videographer Shot List Download all about? 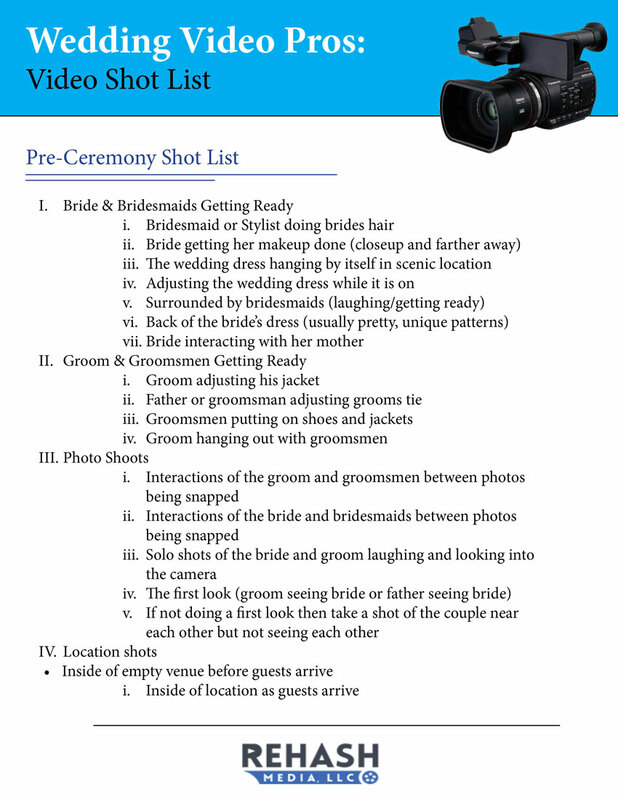 Odds are that you have searched Google and found a shot list for your wedding photographer. But what about your videographer? Shot lists for your wedding videographer are harder to come by because videographers are used less frequently in weddings. To help fill this gap, Rehash Weddings has come up with a comprehensive wedding videographer shot list to help give you ideas on shots your videographer can get. It is true that a lot of these shots are somewhat obvious, but they may not be obvious to everyone, especially if you have never worked with a videographer before. We have also thrown in some great bonus shots that are sure to get you the perfect wedding video. Just fill out the form above and the shot list will be sent to your email address provided! Good luck, and we hope you have a fantastic wedding!